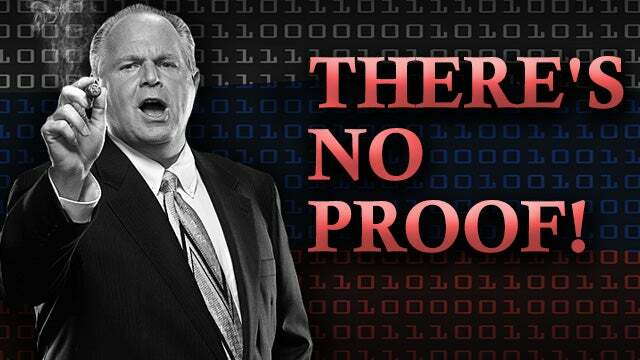 RUSH: The great deception continues. The out-front, up-and-front misrepresentations and lies continue about Trump colluding with Russia. There is no, and has not been any, Trump collusion with Russia, and Mueller and his team have known about this. They’ve known this from the get-go. It’s not that they’ve known it for the past year. They have known it from the get-go. 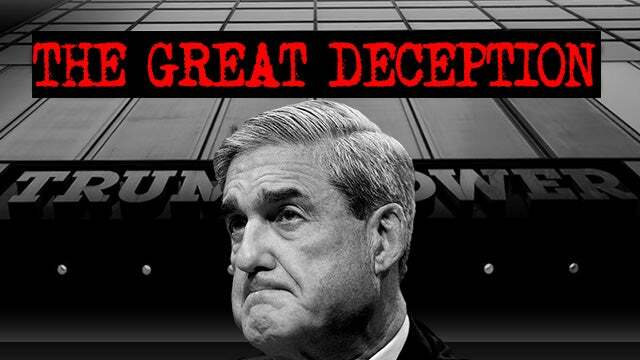 This continues to be one of the greatest frauds, one of the greatest political frauds perpetrated on the American people under the guise of a legitimate criminal investigation. RUSH: Time to wrap up another busy broadcast week right here on the EIB Network. Open Line Friday means you can weigh in on anything. Have at it. Telephone number is 800-282-2882. And if you want to send an email, we accept them and we check them. Sometimes, we read them. Email address, ElRushbo@eibnet.us. 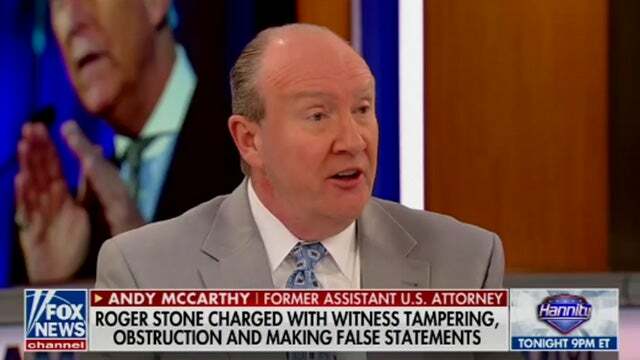 To start things off, rather than paraphrase my buddy Andrew McCarthy… Andy was on Fox this morning with Bill Hemmer right around 11 o’clock, about an hour ago, a little over an hour ago, and he’s read the indictment of Roger Stone. 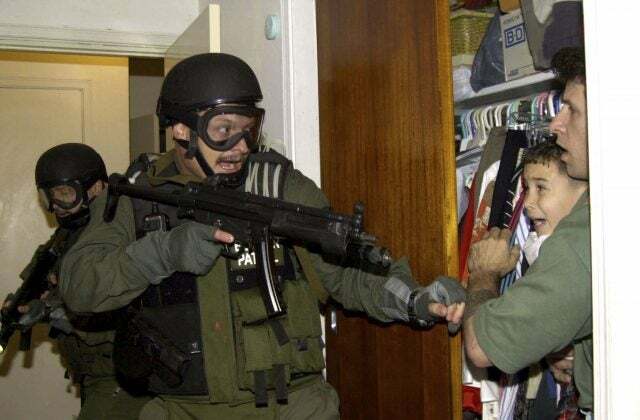 I’m assuming everybody knows by now that Stone was arrested in a predawn raid, much like the predawn raid that captured Elian Gonzalez and sent him back home to the communist paradise of Cuba. Roger Stone was asleep (no doubt this is an Andrew Weissmann move) and armed agents stormed into his home down near Ft. Lauderdale at 6 a.m. to roust him from bed and arrest him under an indictment for lying to investigators. Roger Stone had not committed a crime until the Mueller investigation began. Roger Stone had not committed a crime until they began questioning him. 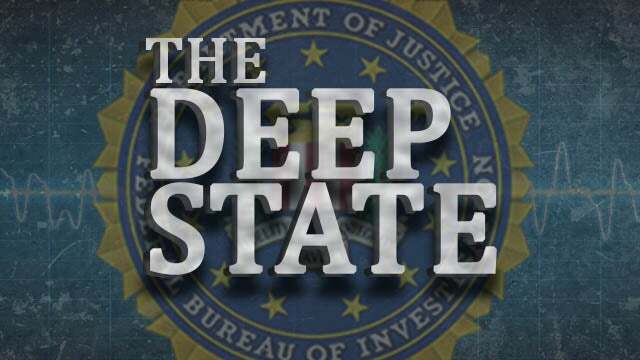 If anybody deserves to be investigated here, it is the investigators and the people who appointed them! They say that Stone lied to investigators. So did Hillary Clinton, for crying out loud! So did half of Hillary Clinton’s campaign staff! Look at this headline. 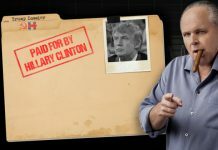 This is the Daily Caller, December 4, 2017, over a year ago: “Top Clinton Aides Face No Charges After Making False Statements FBI — The FBI agent who was fired from Special Counsel Robert Mueller’s Russia investigation team for sending anti-Donald Trump text messages conducted the interviews with two Hillary Clinton aides accused of giving false statements about what they knew of ’s private email server. “Neither of the Clinton associates, Cheryl Mills and Huma Abedin, faced legal consequences for their misleading statements, which they made in interviews last year,” that would be 2016, “with former FBI section chief Peter Strzok. … However, Michael Flynn, the former national security adviser, pleaded guilty last week to lying during an interview,” when Strzok Smirk didn’t even think he did lie. 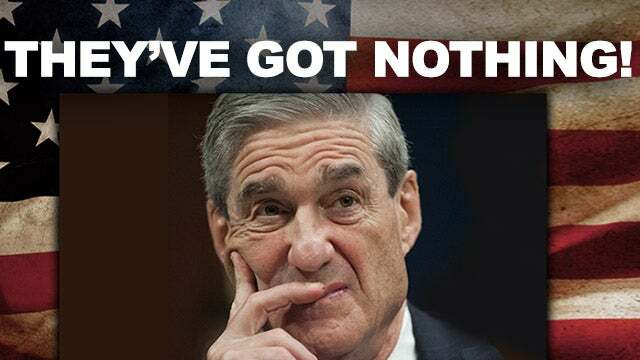 But that didn’t matter to Mueller! Mueller wanted to turn everything upside down and tell Flynn, “I don’t care whether you lied or not. These false statements are “based on inconsistencies in his answer.” Yeah. If somebody sits around and asks you the same question 55 to a hundred different ways, I guarantee you’re gonna have a bunch of different versions of your answer. Remember when Trump said, “Hey, Russia, if you’re listening, maybe you could find the 30,000 Hillary emails.” A joke that Trump was obviously telling in an attempt to goose these people. MCCARTHY: I read that indictment and what it says to me is that the special counsel and the FBI have known for at least a year — probably much longer than that — that there is no espionage conspiracy and there was none between the Kremlin and the Trump campaign. And because of their obsession for investigative secrecy, the thing that the country should have known, the country hasn’t been allowed to know. It’s been a situation where we’ve operated under the possibility that the person we elected as president was suspected of being a Russian agent. They’ve known that wasn’t true for a very long time. And they had an obligation to correct the record. 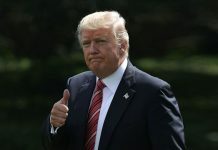 He went on to say that this is completely outrageous, that the country has been roiled, the country has been turned upside down, the country has been divided into partisan camps like we haven’t seen since the sixties — all on a false premise that the investigators have known was false for at least a year and maybe over a year. During the interview he cited a Comey interview before Congress in March of 2017, which pretty much indicates that they knew there was no espionage — and that’s why they were planting spies in the Trump campaign to try to create espionage. There never has been any. So this is a… I don’t know how to characterize this. It’s so much more than a disservice. The investigators have known that, and they’ve sat by and they’ve watched all of these leaks from their office be published as fact, that Trump colluded with Russia, that the evidence is just around the corner. We’ve had all these indictments of all these people, but not one of these indictments alleges anything to do with what everybody’s been told happened. Every one of these crimes, every one of these indictments is of criminal activity that would not have happened were there not an investigation. Roger Stone. There may be a lot of people that don’t like him. The guy’s been a political operative since the Nixon days. He worked for Nixon. So that’s one black mark against the guy. He’s very public and he’s very brazen and he sticks his chin out and dares you to hit him. He prides himself on being all kinds of, you know, tricksters and other techniques to aid the people for whom he’s working. So he’s despised much like Lee Atwater was despised. He’s despised much like Roger Ailes was despised, simply because they were effective and work for the other team. But he has not committed a crime until Mueller’s investigators began questioning him. So that’s all we’ve got now. The swamp, the Washington establishment’s beside itself. The media can barely contain itself. It is so excited, because they think that with every you one of these indictments we’re getting closer and closer and closer to Trump. But the real thing about this is that there has been a false narrative that has been allowed to exist that has been promoted, that’s been encouraged — the belief in it has been encouraged — by the very people who know it didn’t happen. I’m at my wits’ end as to how to deal with this, beyond calling people’s attention to it. This is not the kind of thing that growing up… I mean, you read novels and you see movies about this kind of espionage. But when you really think about it, this is not the kind of injustice that actually happens in the United States. We have too many decent people in too many high places. We have too many checks and balances. We’ve got too many safeguards in place to prevent the runaway, wanton targeting and destruction of political opponents. But apparently, we don’t, and it is… I’ve about reached my limit here in having an ability to express my anger, dismay, and outrage over this. Play sound bite No. 12 again. Not the whole thing. I just want you to listen to the first couple of sentences here from Andy McCarthy — who, by the way, as you know, Andy’s a former prosecutor for the Southern District of New York. He has great reverence for the law and these legal institutions — the FBI, the Department of Justice — as a former employee there. MCCARTHY: I read that indictment and what it says to me is that the special counsel and the FBI have known for at least a year — probably much longer than that — that there is no espionage conspiracy and there was none between the Kremlin and the Trump campaign. RUSH: Stop right there. I want you to just digest that. “I read that indictment and what it says to me is that the special counsel and the FBI have known for at least a year — probably much longer than that — that there is no espionage conspiracy and there was none between the Kremlin and the Trump campaign.” So what actually is going on here? He went on to say, just to remind, that they’ve known it. Their obsession for investigative secrecy has prevented them from… He went on to say there should have been a preliminary report for the good of the country! To turn down the temperature on all of this! They read the news, they watch the news! Hell, these people in the investigation have been feeding the news! These people in the Mueller investigation are the reason we have this partisan divide! They could have calmed this down! They could have told in an interim report, not the final, that there was no collusion. But then if they do that, there’s no reason to exist, as far as they’re concerned — and, remember, the objective here is to get Donald Trump, not Roger Stone and not Michael Flynn and not Paul Manafort. RUSH: There is Roger Stone. He’s reveling in this. He’s now got the entire media surrounding him. He’s out on $250,000 bond, which means that he had to post $25,000 to get out of there. So there he is with his lawyer. Obviously, the guy in the bow tie is his lawyer. I mean, that looks like a lawyer like a condom looks like a condom. So that guy… (chuckling) Well, I’m just saying. Isn’t it obvious? So the media is en masse collected here in deep anticipation waiting for Trump to be indicted by Stone. That’s what they think’s gonna happen. Stone’s gonna save his skin. 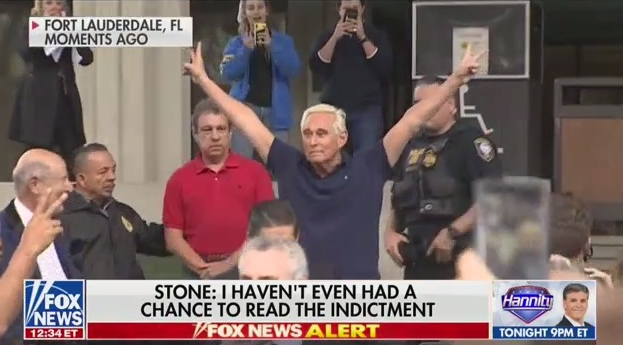 Stone’s gonna say, “Trump made me do everything! Trump made me do it all! I want out! I want out!” That’s what they’re hoping and praying is gonna happen. I’ll tell you one other thing to stop and think about here to again illustrate the political nature of this entire investigation. You know what Mueller is doing? You go after Flynn, you go after Manafort, you go after Stone. Who in their right mind is gonna sign up for the Trump reelection campaign in 2020? I mean, if you can go to jail — if you can be threatened and ruined for working for Donald Trump — who is going to do it? That’s another thing Mueller is doing here, I am convinced. RUSH: Stone is now leaving. He said he didn’t do it. He said the charges have nothing to do with collusion with Russia, that he didn’t do anything with WikiLeaks that he’s been charged with doing. He’s not gonna testify against the president. He loves the president. 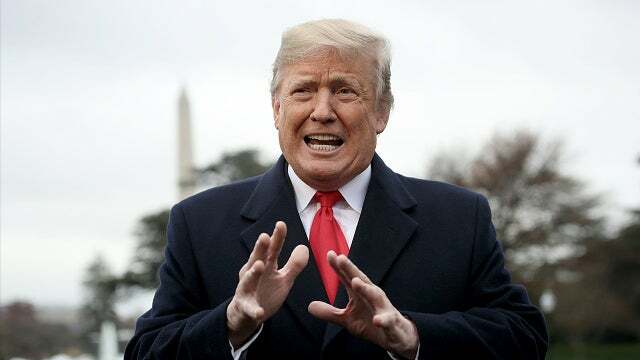 The president’s doing a great job making America great again and he can’t believe how politicized all this has become. The prosecutors came in 19 vehicles, or 19 agents, or 29 agents and 19 vehicles. They disrupted his wife, disrupted his dog. They were very rude. They were impolite. If they would have just called his lawyer, he would have happily surrendered. None of this was even necessary. But, of course, it was necessary for exactly what we got: Pictures. CNN was there. CNN was there, my friends. CNN exclusively had cameras when the FBI showed up and barged into his home at 6 a.m. down near Ft. Lauderdale. The CNN people say, “You know what? No, we were not given any tips! We were not given a heads-up. We just noted that there was unusual grand jury activity yesterday; so we decided to stake out Stone’s house.” Whoa, whoa, whoa! Wait! Wait a minute. Grand jury proceedings take place behind closed doors and it is against the law to leak anything outside the grand jury other than… I mean, if the perp or the witness wants to say what went on in there, the witness can. But nobody else is allowed to, not the lawyers or the grand jurors themselves. Nobody’s allowed — under penalty of law — to testify or leak or talk about what goes on. So what did these people at CNN see? “Well, there’s unusual grand jury activity yesterday; so we decided to stake out his house. It’s a decision that any reporter would have made, any outlet could have made.” Yeah, but you’re the only ones who did! So we’ve got this standard being set up that all kinds of Democrats, Hillary supporters are allowed to make false statements to the FBI. I mean, the fact is that Stone’s indicted for all of these ancillary things that have nothing to do with the entire reason the special counsel exists! I mean, Stone did not commit any crimes until this investigation began and they began to talk to him. No crimes! He had not committed a single crime until the crimes of lying to the FBI, giving confusing answers. Same question being sked 50 times. Different ways. So if you ask the question 50 different ways and you get 10 different answers, you charge the guy with lying. Well, while this indictment proved there was no conspiracy with the Kremlin, you know what this indictment shows? This indictment shows that the investigators didn’t even know what WikiLeaks had, let alone any conspiring with Putin. They didn’t even know what WikiLeaks had, meaning Stone and all these people that were accused of trying to get hold of the emails didn’t know what was in them! That’s why they wanted to know what WikiLeaks had. Everybody was trying to get what WikiLeaks had. WikiLeaks was leaking that they had bombshells. It turned out to be the Podesta emails. This indictment shows Stone didn’t even know what WikiLeaks had! That’s why he wanted to see it! How in the world can there be any collusion whatsoever when the reason people want the WikiLeaks emails is to find out what’s in them? Because, remember my friends — this is never mentioned anymore — the Democrat National Committee computer network system was hacked. The Republican National Committee computer system and network was attempted to be hacked. The Democrat National Committee was successfully hacked. The RNC was not successfully hacked. The Democrat National Committee would never let the FBI forensically examine their hacked network and computers. They hired a private sector firm called CrowdStrike to do that. So CrowdStrike announces whatever they’ve found (which was political in nature), and the FBI just ran with that. But nobody ever succeeded in hacking the Republicans. But at the time, nobody was sure of that. Then WikiLeaks starts saying they’ve got all these emails, and everybody wants to find out what. So Stone and a whole bunch of people are trying to get hold of the WikiLeaks emails, and this indictment conclusively shows that Stone didn’t even know what WikiLeaks had, much less was conspiring with Putin! There hasn’t been of that. As I say, folks, we all know what’s going on here. I’m just at my wits’ end to categorize it properly in terms of how outrageous it is, how unique it is, how we’ve never seen anything like this before. I don’t know if we haven’t. I haven’t been alive the entire time this country’s existed, so it’s not really sensible to say this is the worst thing that’s ever happened in the legal justice system. There probably are similar things or worse. But in the past, whatever they were did not get this kind of the media scrutiny, media promotion, media attention. What is also unique is that the media has now become the leading player in the left-wing agenda to get Donald Trump. They’re not just the recipients of leaks and running with it. They are now literally running the get-Trump operation. They are, and they’re in cahoots with Mueller and his people, and so it’s hard for me to recall anything like this — and the fact that everything this is ostensibly about is bogus? I am spitting anger here and trying not to portray that because that’s not productive. It doesn’t accomplish anything. Anybody can yell. It’s not particularly persuasive. And yet I’m compelled to come up with ways to explain this that would persuade everybody of the genuine dangerous outrage this is. 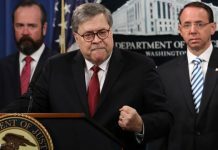 The co-opting of the entire Department of Justice for the express purpose of overturning election results that they don’t like, the manufacturing of a false premise, the creation of the illusion of serious conspiratorial crimes that involve treason — and none of it happened! None of it! And they know it didn’t happen! From the moment they convened their investigation, they know it didn’t happen! So there is knowledge from the beginning of this that they are executing a gigantic fraud on the American people. And their attitude about it is, “Well, we know more than the American people, and we know what a danger Donald Trump is. We know how incompetent he is. We know how he has no business being president. We know that this shouldn’t have happened, and it shouldn’t have been allowed to happen, not with us running things like we do. So we’ve gotta get rid of this guy. He just has no business being president. The American people elected him, but screw them! “They don’t know what’s going on! The American people a bunch of idiots! We can’t trust them! We’re the ones running this country! We’re the ones in charge of the future of America! This Trump guy cannot be allowed to have any success whatsoever!” So you manufacture this false investigation, and it’s worked! Remember the polling data: 42% of the American people! In the last poll I saw late last year, 42% of the American people actually think that this Russian collusion business means that votes were tampered with. The Russians actually somehow manipulated votes and did affect the outcome of the election. That’s what Russian meddling or collusion has come to mean after two years of never-ending news stories featuring anonymous leaks claiming that this happened, when it didn’t. It’s such a gigantic hoax. It’s criminal in nature. There are people… The people who ought to be tried — accused and charged and tried — are the people running this investigation. The people ignoring the actual collusion and crimes that were committed by people in the orbit of Hillary Clinton while she was secretary of state, Barack Obama while he was president, and Hillary Clinton’s campaign committee during the 2016 presidential campaign. That’s where the criminal activity was, and it’s ongoing. To have known for over a year there was no grand conspiracy between the Russians and Trump and yet to continue this, and to continue to indict people for not colluding? I mean, there’s nothing in these indictments about any crime other than after the investigation began. 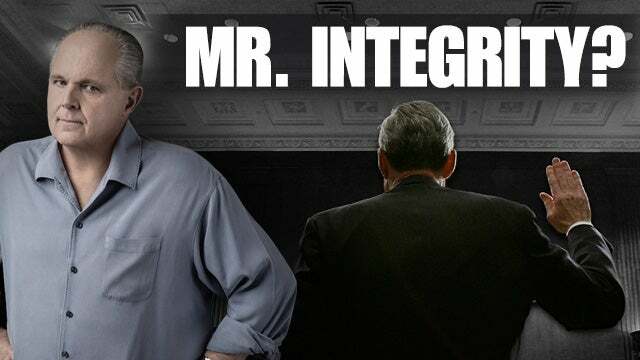 RUSH: I just want to reiterate the Roger Stone indictment… The reason that it proves that there was not a conspiracy! The indictment itself proves that there was not! We don’t need the proof but the fact that they’ve put it in their indictment is worth mentioning. It is all centered around this evil guy, Roger Stone, trying to find out about Podesta’s email, trying to find out what WikiLeaks had. Stone was trying to get a leak from WikiLeaks. There would have been no need to dispatch anybody to find out what WikiLeaks had because it would have been known as a result of any collusion! The fact that Trump campaign people are falling all over themselves trying to find out what WikiLeaks had (which turned out to be the Podesta emails) is what is glaring evidence that there was not any collusion or conspiracy between Trump and Russia. Let’s grab Richard here in Dulles, Virginia. Great to have you on the program, sir. Hello. CALLER: Hey, Rush. I’m a 25-year listener, and I’m really, really, really grateful for what you’re doing for this country as a beacon of hope and truth. Okay? My reaction on the Roger Stone thing is that we reached a new low like the old communist countries. This is looking like a show trial. Remember that phrase? CALLER: Okay? You had trumped-up charges and already knew in advance what’s gonna do. You’ve got CNN down there, 19 vehicles, 29 agents. It’s a big show. What was the purpose of the show trials way back when? It was to make the regime look legitimate, when it wasn’t. This is an attempt for the Mueller team to look like they’re legitimate when they’re not. RUSH: That’s true. It’s an attempt to make people that see the pictures — without even knowing what’s going done, just see the pictures — say, “By God, they got another Trump person! Oh, my God. Look! They’re getting so close to Trump.” That’s what they want people to think. You know, I think it was either Stalin or Lenin who said, “Show me the man and I’ll show you the crime.” Meaning: “I don’t need somebody to have committed a crime. I’ll invent the crime! Just tell me the guy you wanted convicted and I can make it happen.” That’s what we’re looking at here. CALLER: You are exactly right on. I really appreciate you enlightening us on this, because we’ve just really reached a new low big time. RUSH: Can I tell you how…? (sigh) I appreciate your kind words — I really do — more than you can possibly know. But I don’t feel like we’re making much headway here. I’m talking about with public opinion. There’s no way we here in the media anywhere can stop Mueller. All we can try to do is to enlighten as many citizens as possible to what’s really going on, what’s really going down — and this has been a hoax for as long as it has been up and running. And yet, there are 42% of the American people who think the Russians tampered with votes. Even Rosenstein — when the indictment of Russian trolls was announced toward the end of late last year — admitted (summarized), “By the way, we have no evidence that any votes were tampered with. The outcome of no election was ever affected by anything in these indictments,” and that was 13 different Russian trolls that were indicted! And those are show indictments as well.